Some 200 km away from Barcelona, in the province of Tarragona, is the second most important wetland region in Spain (after the Doñana National Park) and the largest in Catalonia, the Ebro Delta. It’s a location of great biological value in Europe and, spanning over 320 square km, it’s one of the western Mediterranean’s most important water habitats. The Ebro, Spain’s largest river, bathes these bountiful Mediterranean lands and has helped to create numerous habitats. The Delta is characterized by its arrow shape and juts 22 km out into the sea, giving rise to the third largest delta in the Mediterranean, after the Nile and Rhone deltas. The climate in the area is mild and the humidity high. In the delta wetlands we find hundreds of species of vertebrates, especially birds. Some 316 species of common birds have been spotted here, and about 360 of the 600 that exist in Europe. 95 species nest here, many of which spend winters and rest during their migrations. Spotting them is quite a thrill for any visitor. This unique setting is also home to large lagoons, saline soils, dunes and rice paddies, which form an essential part of the Delta’s landscapes. Elvers take advantage of the large framework of freshwater points, like the natural river system, the agricultural irrigation networks and canals to start their migration to continental waters, where they will continue their development. It is in this setting that the great fishing tradition of Angulas y Mariscos Roset has been taking place for over 50 years. 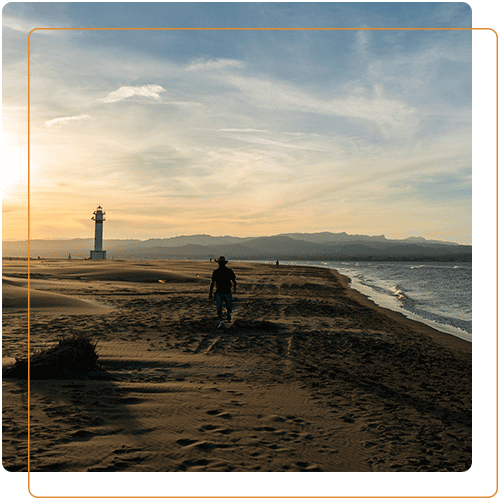 Of its 320 km2, about 20% is natural spaces, 75% is farmland and 5% is urban area, meaning you’ll discover one of the most peaceful and least populated areas along Catalonia’s coastline. 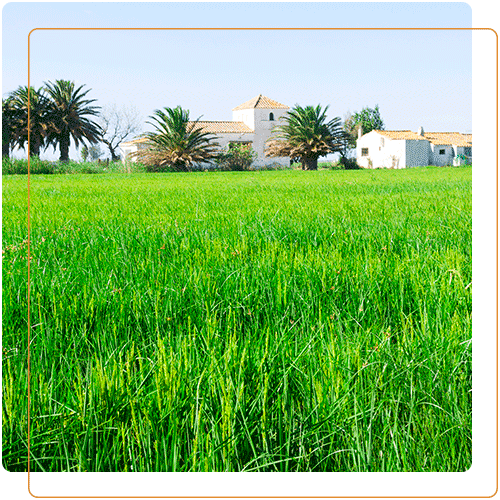 Agriculture, aquaculture, tourism and fishing are the main economic activities in the region. The Natural Park offers a wide range of trails for walking, biking, canoeing and horseback riding. Declared a biosphere reserve, it’s a perfect setting for enjoying the outdoors, water sports, bird watching and excellent cuisine. The island of Buda is one of the main tourist attractions in the Ebro Delta, with its large central lagoon and smaller lagoons immersed in a reedbed (known locally as “quemados”). The landscape in the area is completely flat, which allows tourists to walk or bike its breathtaking vistas. Inland you can find extensive rice fields, whereas reedbeds dominate the landscape along the shoreline. This priceless setting, with its unique flora and fauna, is home to the Ebro Delta Natural Park, located between the regions of Bajo Ebro and Montsià, in the southernmost part of Catalonia. This area was declared a natural park in 1984 and is part of the Tierras del Ebro Biosphere Reserve. There are also kilometers of fine-sand beaches and calm waters along the coast of the Delta, most notably the beaches of Migjorn, Serrallo, Eucaliptus and Trabucador, a strip of sand over 10 km long with water on both sides. It was in this setting of unequalled natural wealth that Angulas y Mariscos Roset was founded, a company that, generation after generation, has become renowned all over Europe for its tradition and commitment to the inhabitants of the Ebro Delta, where, surrounded by unrivalled landscapes, we select and stock the best product for our customers.